There is no shortage of skilled animators in Korea, but following the floundering of the local animation industry in the 1970s, most of that talent went into domestic TV production or was sucked into the outsourced contracts of far more lucrative foreign shows such as The Simpsons. Over the last few years, a handful of new feature animations have cropped up in Korean cinema and are serving as embers for what will hopefully become a full-fledged industry in the coming years. Several Korean animations are in store for 2014, and the first of those to hit theaters will be The Satellite Girl and Milk Cow, the feature-length debut of Jang Hyung-yun, who previously made a number of acclaimed shorts, including A Coffee Vending Machine and Its Sword (2007). Il-ho is a curious satellite that gazes down to Earth as she circles the globe, wondering about the human condition, particularly that emotion called love. Singer-songwriter Kyung-chun turns into a milk cow when he suffers the heartbreak of his girlfriend leaving him and soon finds himself on the run from the Incinerator, an evil machine that tracks down and devours creatures with lonely hearts. Coming to his aid is Merlin the Wizard, who has taken shape as a role of toilet paper, and before long Il-ho falls down to earth and is transformed into a girl. 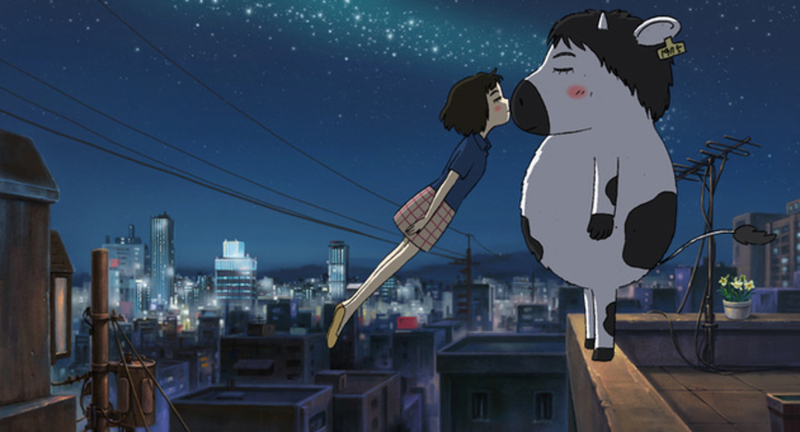 Whimsical and fantastical, The Satellite Girl and Milk Cow unavoidably brings to mind Japanese animation, particularly the works of the celebrated Studio Ghibli. Though not heavily aping their style, the similarities serve as a reminder that Korean animation still lacks anything resembling a cohesive aesthetic. Hollywood and Japan have very recognizable animation styles and even French feature-length cartoons have developed some common traits. Being such a close neighbor (not to mention a former colony) of Japan, it's understandable that this kind of borrowing would occur. The Korean animations that have cropped up in the last few years are each quite different from one another, from popular TV character Pororo's formulaic big screen debut to the gritty and dark social works of Yeon Sang-ho (The King of Pigs , The Fake). Earnest and cute, The Satellite Girl and Milk Cow is a promising, if somewhat light debut from Jang. Lacking the emotional catharsis or razzle-dazzle of similar Japanese offerings, the film nonetheless displays plenty of its own creativity throughout its sweet and charming narrative. However, though Jang's film is well drawn it does seem a little rough around the edges. It could be that he lacked the funding to properly realize his vision (the film was not backed by a major studio), as evidenced by the cheap 3D backgrounds that are used, such as in the space-set opening scene. But perhaps the film's greatest weakness lies in its editing. Fading to black and back again is the main way that the film transitions from one scene to the next, a technique that hurts the film's momentum, in addition to seeming a little lazy. Those downsides aside however, The Satellite Girl and Milk Cow is a breezy watch bolstered by its motley crew of odd characters. Though dubbing tracks are likely to be added before the film travels overseas, the Korean voice cast features frequent Hong Sangsoo actress Jung Yu-mi and Punch (2011) actor Yoo Ah-in, both also featured together in last year's drama Tough as Iron. Yoo is more than competent as Kyung-chun, the most normal character in the film (despite being turned into a talking milk cow) while Jung comes off a little better, making her robotic character funny and adorable. With its juvenile fantastical characters and a little toilet humor for kids, and its college-age romance and possible sexual innuendo (in a surprising milking scene) for older viewers, the film may have a little trouble finding an audience with elements that are a tad scattershot. Though unlikely to completely satisfy any viewer, The Satellite Girl and Milk Cow's problems are hardly life threatening and there's enough charm, skill and promise to look forward to a stronger follow-up. I for one hope that Jang and other talented Korean animators (of which there are many) are afforded more chances to rebuild the country's long dormant animation sector.